Bernardo O'Higgins Riquelme was the illegitimate son of Ambrose O'Higgins, an Irish born Spanish Official and Isabel Riquelme, a prominent Chilean lady whose family was part of the Spanish ruling class. From these inauspicious beginnings, Bernardo O'Higgins would eventually rise to lead the fight for Chilean independence and become the 3rd supreme director of Chile and the first to rule it as an independent nation. Bernardo's father, Ambrose O'Higgins, held many titles in his lifetime. The Marquis of Orsono, the Marquis of Vallenar, Captain General of Chile, Viceroy of Peru, and his ancestral Irish title of Baron of Ballynary (in exile). He was from and old aristocratic Irish family who fell on hard times. His grandfather, Sean Duff O'Higgins, was the lord of Ballynary and was married to a descendant of the O'Connor clan who ruled Ireland until A.D. 1000. The O'Higgins clan owned great expanses of land until the expropriations of the Catholics by Oliver Cromwell and his conquest of Ireland caused the family to lose all their holdings. With little options left to him in his homeland save servitude, he immigrated to the catholic friendly Spanish Americas in 1756 settling in Argentina. After trying his hand in several commercial ventures he signed on with the Spanish Imperial service as an engineer and moved to the less established colony of Chile on the advice of a friend. 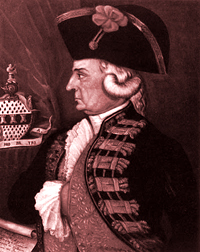 There he quickly rose in the ranks eventually becoming the Military Governor (captain General) of Chile in 1788. He had an affair with the daughter of a prominent Chilean leader Isabel Riquelme and from this affair was born a son who was named Bernardo Riquelme. Although he was given his mothers last name, it was noted on his certificate of baptism that he was the son of Ambrose O'Higgins, the Marquis of Orsono. His mother married and had a family with whom he spent his early years in relative anonymity. Although the two met rarely if at all in person, his father Ambrose supported his son financially and saw that he received an education. When he became viceroy of Peru, he sent young Bernardo to London to continue his studies. Here he learned of the American independence movement and befriended Francisco de Miranda, a Venezuelan revolutionary. After his studies he moved to Spain where he met and formed a friendship with José de San Martín, later the liberator of Argentina. He lived in Spain until 1800 when he decided to return to Chile. He was delayed reaching south America by the British who were then fighting France and Spain and then illness, he did not return to Chile until 1802. Upon his Arrival he took his fathers surname and became Bernardo O'Higgins Riquelme. His father passed away in 1801 and upon his return he inherited his estates and began running his fathers large farms eventually joining the government as a representative from his territory. Soon after, Napoleon invaded Spain and placed his brother Joseph on the Spanish throne. In Spain rebels fought the occupation causing confusion in Chile where most refused to recognize either Joseph or the rebels as legitimate. On September 18, 1810 Chilean leaders decided on limited self-government until the Spanish throne was restored. This date is now celebrated as Chile's Independence Day. Many were not satisfied with limited self governance and Bernardo was one of them, they formed a National Congress of which Bernardo was a member. Royalist were opposed to such a movement which led to an inevitable armed conflict between the two parties. Bernardo formed several cavalry units from workers on is vast estates and took to the field in 1813. His first taste of battle was the battle of Sorpresa del Roble where he proved himself a brave and capable commander. With the battle cry ' Live with honor or die with glory. He who is brave, follow me' he defeated the loyalist forces and his first taste of battle became his first taste of victory. The tides soon changed and the royalist forces with help from Peru, gained the upper hand and eventually defeated the green forces of the national congress and began in earnest the re-conquest of Chile. Bernardo and the revolutionary forces moved to Argentina to regroup, gather support, plan, and train. In 1817 O'Higgins returned with and army under the command of his friend Argentine General Jose de San Martin and engaged loyalist troops, defeating them, and taking the city of Santiago. San Martín was offered the governorship which he refused in order to continue the fight in Peru with the objective of capturing Lima. 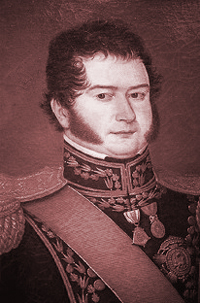 Instead, Bernardo O'Higgins became Director Supremo de Chile. The civil war raged on until the Battle of Maipú in 1818. The battle left 2,000 Spaniards dead and 3,000 captured; the patriots lost about 1,000 men. The battle ended their struggle for Chilean independence and Don Bernardo O'Higgins held supreme power in Chile. He turned his attention to building the country. He created a new government; a republic, and laid the grounds for peace, law, and order. He established courts, colleges, libraries, hospitals, cemeteries and modernized many Chilean cities. He instituted reforms in the economic and social order, and with the help of San Martín and Thomas Cochrane (later 10th Earl of DunDonald), he created the Chilean navy and the accumulation of troop ships. This fledgling navy took part in the conquest of Peru in 1821, and San Martín became protector of Peru. His more radical and liberal reforms, (such as the establishment of democracy and abolishment of nobility titles) angered the powerful conservative large-land owners. Also, his government was involved in the murder of adversary independist leaders and he was deposed by a conservative coup on January 28, 1823. Under pressure he agreed to resign and left the country with his mother, his sister (both who took his name) and his son, to settle in Lima. Embittered by the failure of his countrymen to appreciate and adopt his reforms, Don Bernardo and his family lived on estates given to him by the new Peruvian government where he busied himself with managing the land, and worked to continue the independence movement of other South American countries. His health began to fail, and although he was given permission to return to Chile, he suffered a heart attack and was unable to travel. He died in Lima on October 24, 1842. He was buried with great honor in Lima. In 1866 his remains were brought back to Chile by the Chilean navy and buried in the Cementerio General de Santiago, again with great honors as a hero of the Independence. Don Bernardo O'Higgins is remembered and honored as a national hero and a founding father of Chile.